Assyrian kings built on a lavish scale. 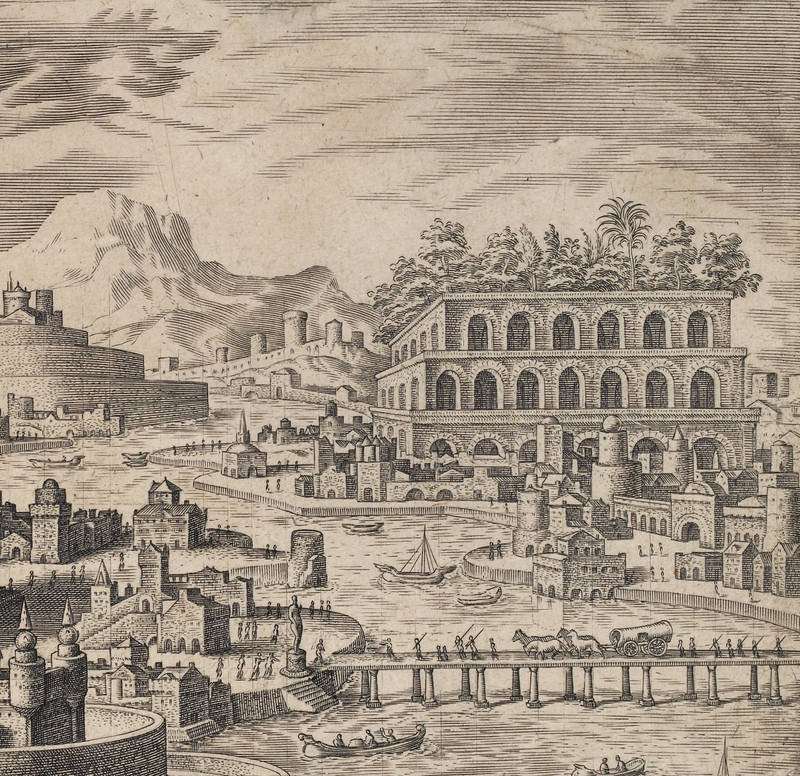 Ashurbanipal’s capital at Nineveh was a vast metropolis and the palaces were a symbol of the King’s wealth and power. However, it wasn’t just the architecture that made the royal residences impressive. Surrounding the palaces were orchards, game parks and lush and exotic gardens that evoked a paradise on earth. Relief depicting a harpist and lyre player with tame lion beneath palms and pine trees. 645–640 BC. North Palace, Nineveh, Iraq. The Assyrian kings boasted in inscriptions about collecting plants and animals from across the empire for the gardens. Orchards were planted with a plethora of plants, alongside pomegranate, pear, fig and olive trees. In creating these idyllic settings, rulers demonstrated their ability to bring abundance and harmony to the world. I planted alongside the palace a botanical garden, which has all types of trees and every fruit and vegetable. The gardens at Nineveh were irrigated by an immense canal network built by Ashurbanipal’s grandfather, Sennacherib. He brought water to the city over a great distance using channels and aqueducts to create a year-round oasis of all types of flora. Sennacherib king of the world king of Assyria. Over a great distance I had a watercourse directed to the environs of Nineveh, joining together the waters… Over steep-sided valleys I spanned an aqueduct of white limestone blocks, I made those waters flow over it. A scene from a palace relief shows aqueducts in lush parkland near the city. The orchards and gardens are watered by several channels that cut across the landscape. The panel would have originally been painted with rich colours, which have been recreated in the representation below. Relief showing orchards and gardens watered by an aqueduct. Nineveh, Iraq. Assyrian kings stocked their game parks and pleasure gardens with animals, including deer, gazelle and even lions. On this relief, a lioness and lion with a magnificent mane relax in an idyllic garden. 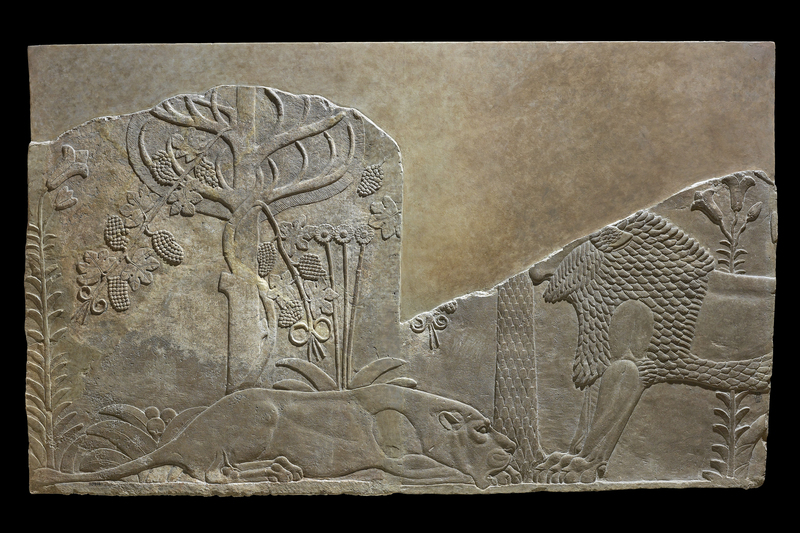 For the Assyrians, lions represented all that was dangerous in the world, so the placid lions on this relief may demonstrate the kings’ abilities to control the wild forces of nature. Lions were also hunted in the royal game parks. Assyrian kings proved they were worthy of protecting the empire by killing these fearsome beasts as part of drama-filled public spectacles. The Assyrian lion hunt is famously represented in the reliefs from King Ashurbanipal’s palace. Carved panel depicting a lion and lioness relaxing in a lush garden setting. 645–640 BC. Nineveh, Iraq. The gardens of the Assyrian kings weren’t simply beautiful spaces; they demonstrated the ability to maintain peace and prosperity in the empire. One scene from a palace relief shows Ashurbanipal reclining on an elaborate couch in a garden beside his queen. Musicians entertain the royal couple and food is served by attendants. A lush backdrop of pine trees, date palms and grapevines evoke fertility and regeneration. However, if you look carefully, you can see that in one of the trees hangs a war trophy – the head of Ashurbanipal’s enemy – a reminder that this paradise was attained through a long and bloody war. 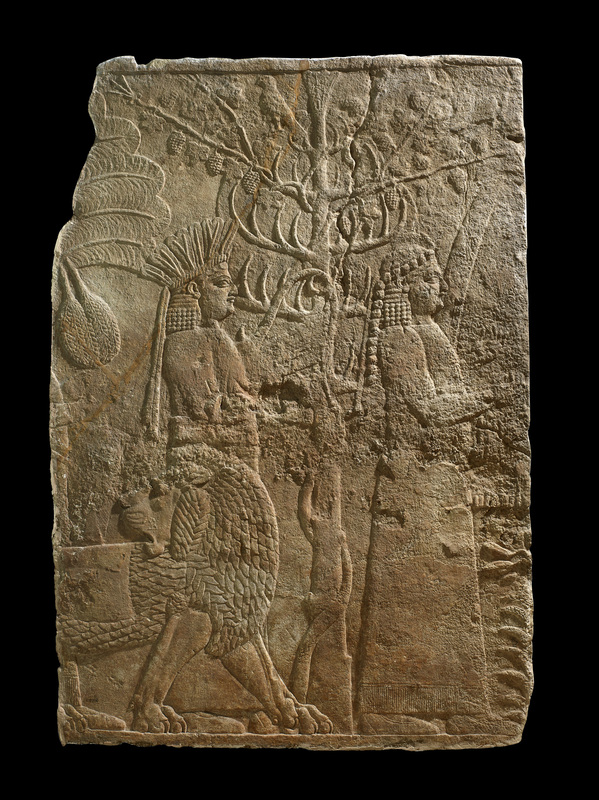 Carved panel depicting Ashurbanipal and his queen in a garden. The head of Ashurbanipal’s enemy hangs from a tree on the far left. 645–640 BC. Nineveh, Iraq. The real Hanging Gardens of Babylon? The Hanging Gardens of Babylon represented in a 1572 print by Philips Galle. 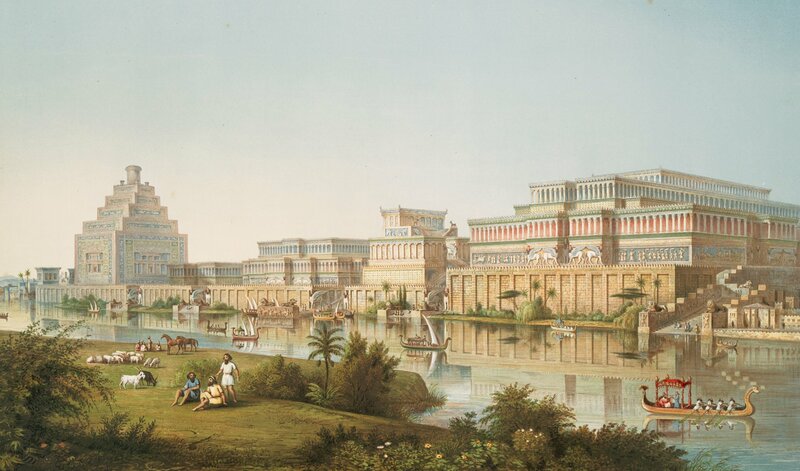 Some scholars have argued that the legendary Hanging Gardens of Babylon – one of the Seven Wonders of the Ancient World – were actually those at Nineveh. They claim that later writers had confused Nineveh and Babylon, which may help to explain why excavations at the site of Babylon have never yielded any evidence of raised architectural gardens there. 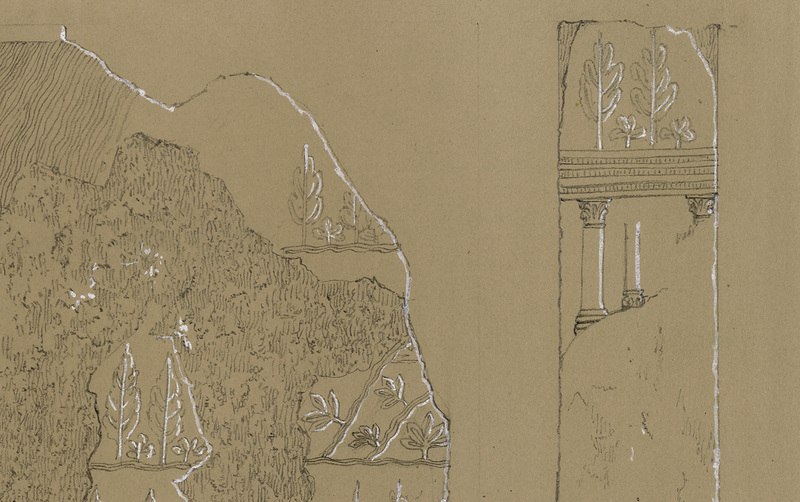 Drawings of a now lost relief from Nineveh show trees growing on a roofed colonnade, similar to those described in classical accounts of the Hanging Gardens. Even if it isn’t the case that the Hanging Gardens were those at Nineveh, they may have inspired later gardens at Babylon and elsewhere. Drawing of a now lost relief depicting gardens. The top right part of the relief appears to show trees growing on a roofed colonnade. You can discover more about Ashurbanipal and his world in the BP exhibition I am Ashurbanipal: king of the world, king of Assyria, from 8 November 2018 – 24 February 2019.